The Cranbury United Methodist Church is happy to make its staff and facilities available to you at this joyous time in your lives. We hope that by this service of Christian Marriage your life together will be blessed and that your wedding day will be remembered with joy. 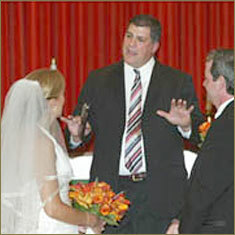 A Christian wedding service is somewhat different than a secular wedding service. A Christian wedding is a worship service which places God and Christ at the center of the event. As you come into His presence, and seek His help may your lives together as husband and wife be blessed. The pastor of the United Methodist Church has been given the privilege, by the Church and State, to assist couples as they join themselves together in a Covenant of Holy Matrimony. The role of the pastor in this context, is to assist the couple as they prepare for this step in their relationship. Feel free to call upon him whenever he might be of assistance in your marriage. For additional information or to make arrangements, please call the church office at 609.395.1737 or contact Pastor Ron via our secure Contact Us form.